RisqVU-GRC features simplified and practical risk management workflow, audit management workflows, and user awareness management under a single collaborative automation framework. It also churns out multiple information security management metrics, ready-to-use compliance reports, and visual risk analysis, so management teams can get necessary insights on risk posture, risk assessment outcomes, risk treatment progress, and compliance levels of the organization in a glimpse. With RighIT’s state of the art GRC management platform, you can easily centralize and standardize your GRC operations. With RisqVU, you no more need to find a needle in a haystack as it is organised with industry specific requirements. Shorten your timeline for common certification and compliance standards including HIPAA, ISO27001 and NERC with finely tuned RisqVU GRC’s processes and workﬂows. 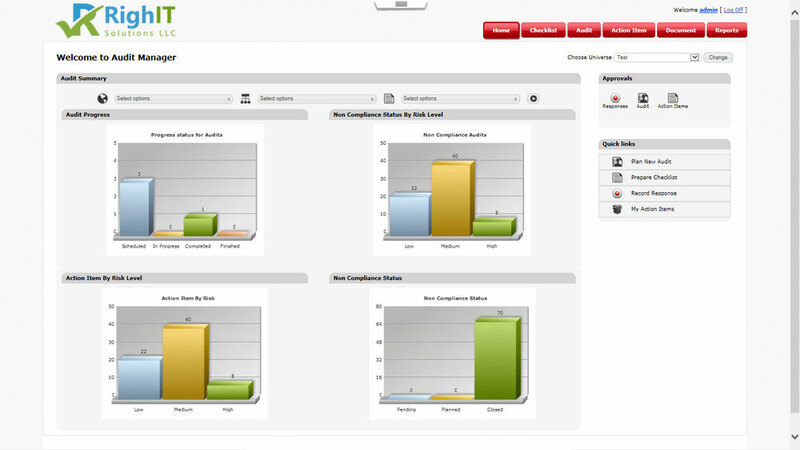 With RisqVU GRC’s audit engine you can self-evaluate and upload your data and audit evidences. It also automates the end-to-end audit life cycle process of planning, audit execution, evidence collection, reporting and action tracking. So it’s the end of your labour work. With IT at every corner and its security at risk, RisqVU-GRC can help you sustain with its advanced security and risk awareness in various risk mitigation strategies. With RisqVU-GRC, centralize the compliance implementation and monitoring process through consolidated asset and risk data, monitoring, audit, and reporting modules.